Wallpaper is one those items in a house that seems replaceable; a product of mass production that can be changed to suit your furniture or your mood. However, in the past, wallpaper was an incredibly rare thing and actually very valuable. Wallpapers started out as a product that the slightly less elite (though still very wealthy) could use in place of tapestries. 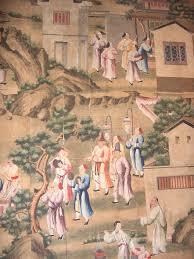 In fact they were hung like tapestries too – as a large sheet of paper. Now this is around the 16th century so they were hand printed and hand painted. Now as you can imagine, these wallpaper hangings did not last very long and as such not many still survive today – the earliest surviving piece dates to 1509 and is only a very small piece. Fast forward to Henry VII and his decision to split the Church of England from the Roman Catholic Church, this caused a huge falling out between trading companies in Europe (especially between France and England) and as the aristocrats no longer had access to large Flemish tapestries that were oh so fashionable and popular so they turned to wallpaper instead. 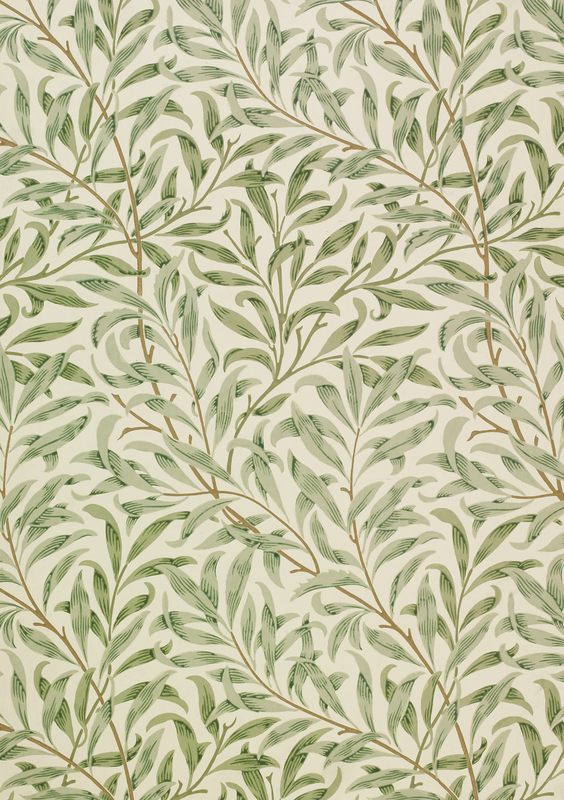 By the mid 18th century, England was the leading wallpaper manufacturer in Europe and started to make more affordable designs aimed at the middle classes. As they were more affordable and more available, manufacturers had to make certain wallpapers that would still appeal to the aristocrats and the mega rich so they started experimenting with wallpapers that acted like materials, like leather, silk and velvet. the most popular turned out to be flocked wallpaper, where a designed was pressed onto paper and then pieces of wool or silk were blown across it and they only stuck to the printed design. Oriental designs were also becoming increasingly popular so plain wallpapers were shipped off to the China and Japan, whereupon they were hand painted with oriental designs and images of everyday life. Along came the 19th century and the development of steam-powered printing presses, this meant that wallpaper became available to everyone, not just the rich and aristocracy. It also heralded an age of more scenic wallpapers with French influences. By the time of the 20th century, wallpaper had established itself as one of the most popular items in a house but unfortunately its reign had to come to an end and the idea of wallpaper gave way to pain painted walls towards the late 1900s. So over the last few hundred years that wallpaper has been around, there have been suggested many different ways of keeping it clean. As most wallpapers were regarded as insignificant, there was little bother in cleaning them. However, it where finer wallpapers are involved that it gets interesting. For these wallpapers, light levels were kept to a minimum and some were even varnished to protect them. Some maids dusted the wallpapers whilst others used bread dough to help get rid if dirt. unfortunately bread dough leaves behind traces that insects and molds love or they became greasy and streaky. 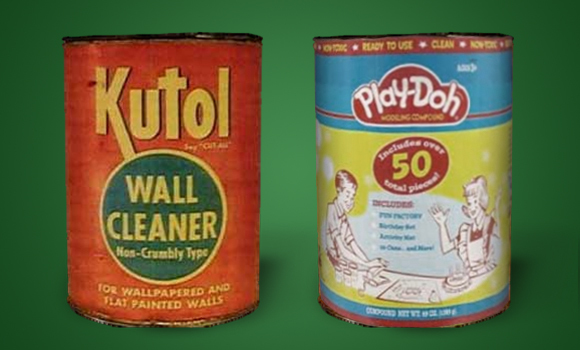 Play-doh, the beloved children’s toy, was originally invented as a wallpaper cleaner in the 1930s. However, when a classroom of children started using it to make models, the marketing changed and it became a children’s toy. Nowadays with historic wallpapers we use methods that involve less chemical and avoid taking the wallpaper off the wall unless strictly necessary. We clean wallpaper in order to preserve it for longer. If we left it dusty or with stains a) it does not look very nice and b) often dirt and stains hide a bigger problem. We had a similar case with the wallpaper in the South Spare bedroom. With all the rains last spring, one of the chimneys sprung a leak and seeped down through the house. The wallpaper got wet and then later dried out leaving a brown water mark. If we had left the leak the water would eventually have flooded the room and done a lot more damage. By catching it at the water mark stage we managed to repair the leak and re-point the chimney to ensure it is watertight. However with that fixed, the wallpaper needed to be inspected and cleaned to check for any further damage – damp walls tend to grow mold and attract silverfish who eat away layers of paper. The wallpaper was dampened until the adhesive gave way and the wallpaper sheet was gently peeled away – it takes a lot of skill to keep damp wallpaper in one sheet. 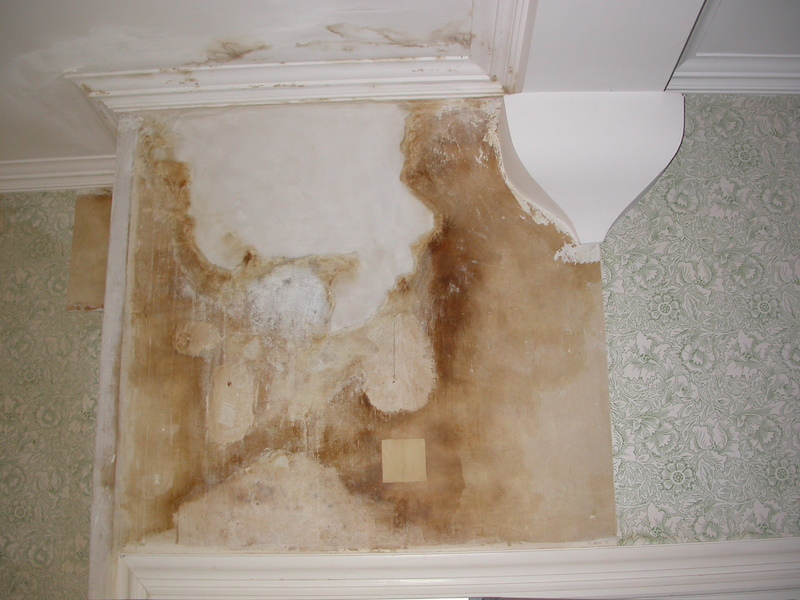 It was then wet cleaned – a sponge slightly dampened with a mild soap and water is applied gently to the wallpaper removing the water stains. When the chimney sprung a leak, it also damaged some of the paper in the Larkspur bedroom. This had already been wet cleaned once (which can only be done once in its lifetime) so historic larkspur wallpaper was pasted over the top – so seamlessly it is difficult to spot which is the original. while our wallpaper conservator was here we thought it wise to ask him to clean the trellis wallpaper in the dog leg corridor. Being trapped in a small space created by a false ceiling caused dust and dirt to build up. 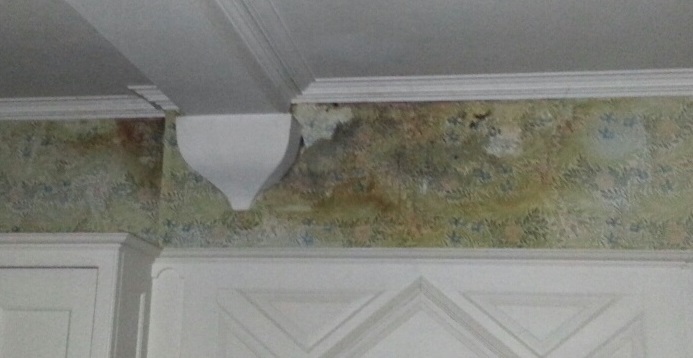 A smoke sponge, was used to clean this wallpaper, gently erasing away any buildups of dirt and marks. Categories: Uncategorized | Tags: Arts & Crafts, Chinese, cleaning, collection, conservation, conservator, damp, England, Flemish, flocked, France, French, Hand painted, hand printed, history, Larkspur, Morris and Co, Oriental, paper, polesden lacey, printing press, Silverfish, tapestries, Wallpaper, wallpaper hangings, William Morris, Willow Bough | Permalink. At the start of this year, I wrote about how strong driving winds and rains had caused old damp patches and leaks to reappear in some of the south facing rooms in the house. In the Larkspur Bedroom and the South Spare exhibition room, the damage was particularly bad. Both rooms have a history of leaks and damp, and this time they had developed leaks above the fireplaces. The water ingress had badly stained the Morris & Co. wallpaper, and – despite the use of fans and a dehumidifier to circulate the air and stablise the humidity levels – the damp conditions led to mould forming directly on the paper. The water had come in under the flashing around the chimney, so the first thing we did was to renew the flashing and pointing in this area. 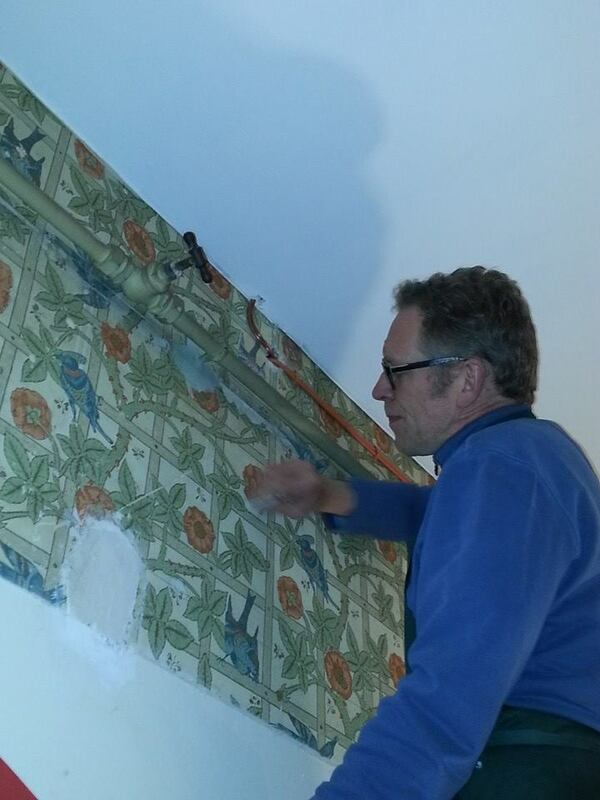 Then it was the turn of the wallpaper; and so a conservator recently came and worked on the affected areas. 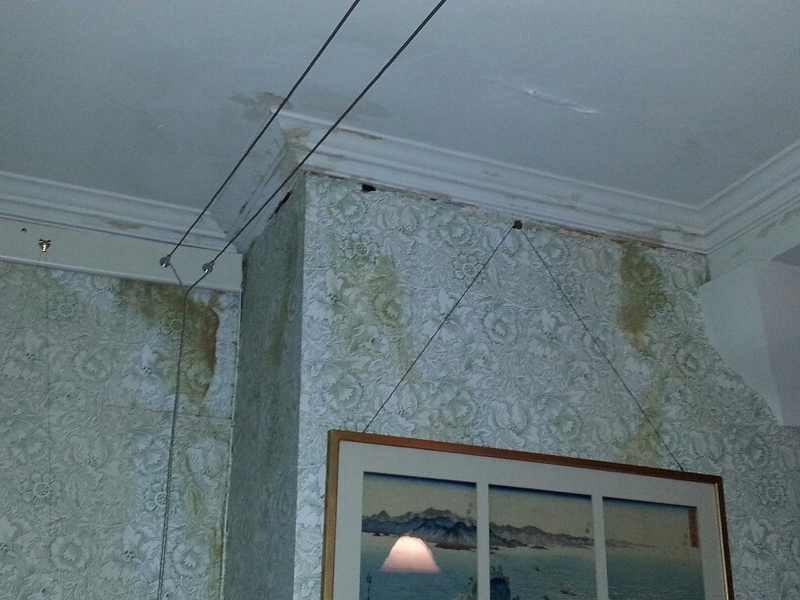 He was able to remove much of the unsightly mould from the Larkspur wallpaper. 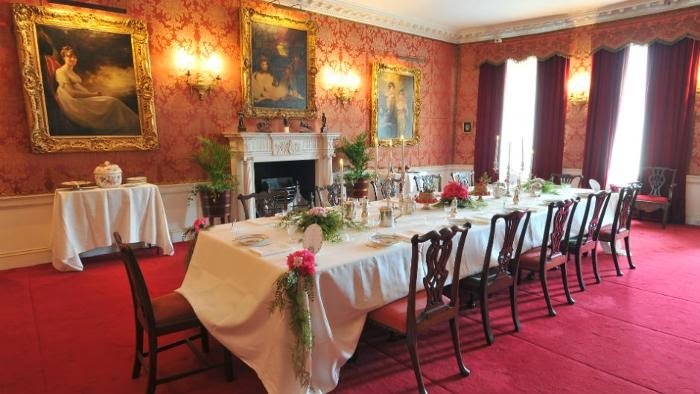 The mould was very noticeable, and had begun to detract from the charm of this room. Although the wallpaper is still stained, it looks much better. Once the area has thoroughly dried out, the conservator will be able to come back to carry out work to remove the staining. In the South Spare exhibition room, the wallpaper was carefully removed by the conservator, who has taken it away to begin a treatment to wash out the staining. It is quite a long process – not only does the delicate work on the wallpaper need to be carried out, but we also need to wait for the wall itself to dry out properly before rehanging the paper. This can take months, so it’s likely that the wallpaper will be back at Standen early next year. 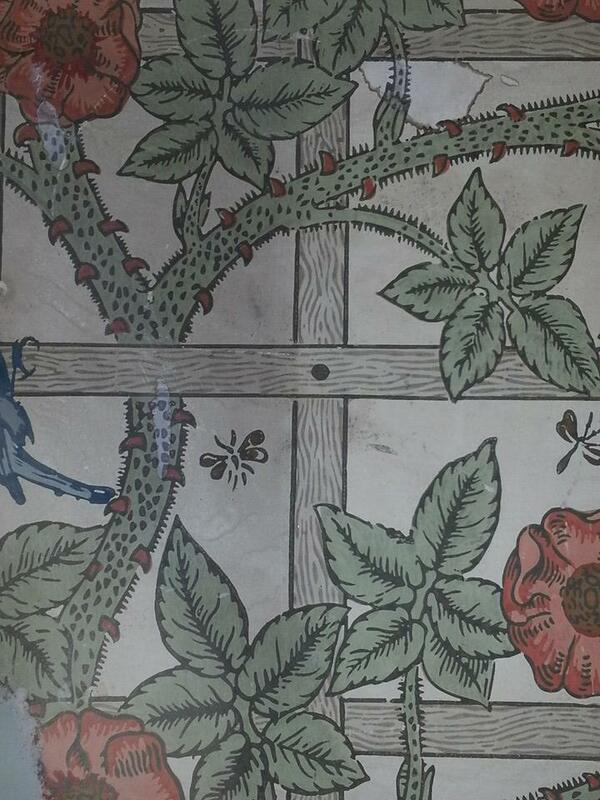 Categories: Uncategorized | Tags: conservation, conservator, Hannah, Morris & Co, Wallpaper, William Morris | Permalink.